Quote, verse, proverb software for Windows. ...... about all your favorite quotations, sayings, verses, ideas, and proverbs in a simple form. 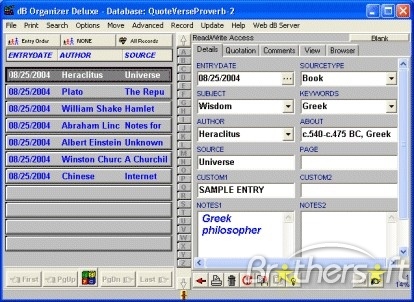 * Quote-Verse-Proverb Detailed: complete database software solution that allows you to maintain data about all your favorite quotes, sayings, verses, ideas, and proverbs in a detailed form. For the power user, Quote Organizer Deluxe affords the simplicity of wizards that make it easy to set up and use software solutions that you create. * Flexible productivity tool: Using a helper program Database Designer you can easily modify quote database templates included in the package or create a new one. * Learn once use multiple times: You can use application for all your quote, proverb, verse management needs. You can create your own quote software organizers or you can try our ready-to-use solutions: See other database solutions. * Save time organizing your records: Results of time consuming tasks or repetitive processes can be saved into templates. Movie database, organize, catalog, and manage your movie collections on your PCs. Recipe Software for Recipe Enthusiasts! A Windows software for private and corporate collectors, small galleries. Qweas is providing links to Quote Organizer Deluxe 3.41 as a courtesy, and makes no representations regarding Quote Organizer Deluxe or any other applications or any information related thereto. Any questions, complaints or claims regarding this application Quote Organizer Deluxe 3.41 must be directed to the appropriate software vendor. You may click the publisher link of Quote Organizer Deluxe on the top of this page to get more details about the vendor.